Time for another Narnia giveaway around here! I picked up a copy of this gift edition of The Magician's Nephew which contains full colored illustrations by none other than Pauline Baynes. This is really a lovely hardback edition of the book that is super fun to share with kids because of all of the pictures scattered throughout. My kids love looking through this book (and I do too!). I also have a paperback edition of The Magician's Nephew to pass long to the runner up in this contest. If you do not have a copy of this title, here's your chance to win either a lovely gift edition or a regular paperback. Either which way it's about the story and I'm excited to be able to pass these books along to two of you. Care to win? Simply leave a comment below, including a valid e-mail address. 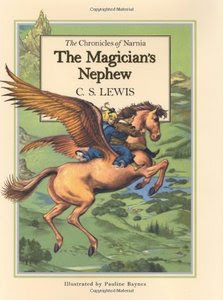 This contest is open to US and Canadian residents and will be open through Tuesday, July 31st (which is, coincidentally, the last day of the Chronicles of Narnia Reading Challenge). YIKES! THIS CONTEST IS NOW CLOSED. THE WINNER OF THE GIFT EDITION, as selected by Random.org, IS TRAVELER. The winner of the paperback edition is Annette! Congrats to you both! I have a grandchild that would just love this book, it sounds very exciting. Since we only have the large single volume in our library, I DO think we need to begin collecting the single books. This sounds beautiful! I do own Magician's Nephew, but it's my own paperback copy from almost 30 years ago. (Yikes!) We have this Wardrobe from this same set, and it is lovely, so I'd love to win a copy of the hardback. Do you know if all of the books are available in this edition? We do have a paperback copy of this, but the hardback sounds lovely. Of course, if I won the paperback, I would pass it along to another family, or save it so that both my kids have their own set (eventually).